Soon after they​​ founded​​ the​​ Newgren​​ Company,​​ George Newlin and Henry Green found​​ competition​​ in the market​​ quickly​​ increasing​​ as another company entered into the business of outfitting Jeeps​​ with hydraulic lift systems.​​ This time, it was not a newly formed company, but a long established family owned business – the Monroe Auto Equipment Company of​​ Monroe, Michigan. And,​​ they brought to the table a new three-point hitch of their own design. Monroe had​​ developed​​ close relations with Willys-Overland Motors, Inc.​​ years before the war. This relationship was strengthened further once​​ Brouwer​​ took a seat on the Willys board of directors. The Willys board had elected Mr. McIntyre along with Arthur J. Wieland on January 21, 1947.5​​ Mr. Weiland was actively​​ serving as Willys Vice​​ President​​ of Distribution at the time​​ of the appointment. Newgren and Love lift​​ assemblies​​ were designed to mount to the back of the Jeep completely below an open tailgate. Thus, the upper link point and the two lower link points did not fall at the corners of an equilateral triangle. The result was that they created a very squatty isosceles triangle with the upper link point forced to fall beneath the tailgate. 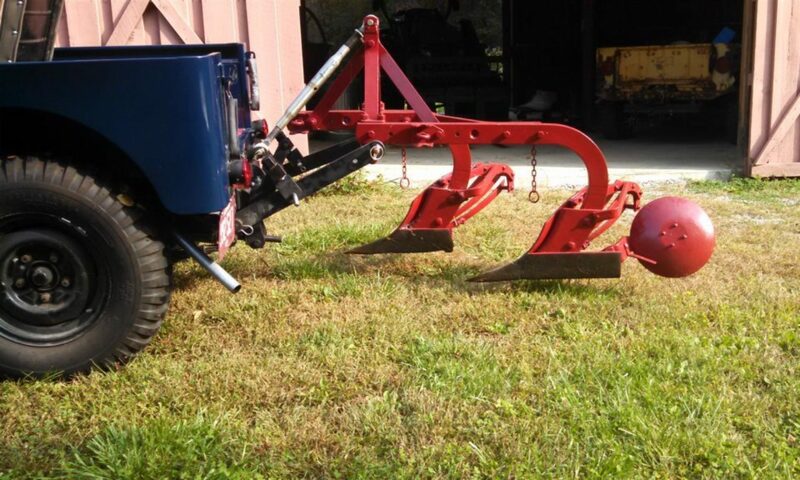 This unique geometry was carried over in part to the layout of the upper hitch point and the two lower hitch points on the plow.​​ This geometry resulted in a reduced mast height on the plows used by Love and Newgren when compared to those used with the Ford tractor.